(Newser) – Leaked oil from a ruptured pipeline in an eastern Chinese port city exploded today, killing at least 35 people, injuring 166, and contaminating the sea in one the country's worst industrial accidents of the year, authorities said. 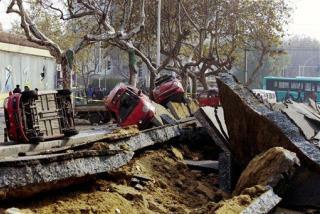 The leaked oil triggered two huge blasts, one of them tearing up concrete along a city road in Qingdao. Photos posted online showed ripped slabs of pavement, bodies, overturned vehicles, and shattered windows in nearby buildings. On behalf of the Chinese government I would like to clear up some misconceptions about recent reports of a pipeline explosion. Once again the western press jumped on erroneous rumors made by Nepalese dissidents (who will be dealt with later). Everything is fine in China and we did have a small incident involving a very tiny line and nobody was hurt. Now please go back to your western tv dinners and video games. I agree with you NorCalHal; Godzilla did this.